Watch ​Childish Gambino Crash Chance the Rapper's Open Mic Night to Perform "This Is America"
Always looking for ways to give back to his city, Chance the Rapper hosted an open mic event in conjunction with the Chicago Public Library last night (June 11). And as if Chance wasn't enough of a draw, he brought along his friend and collaborator Donald Glover. 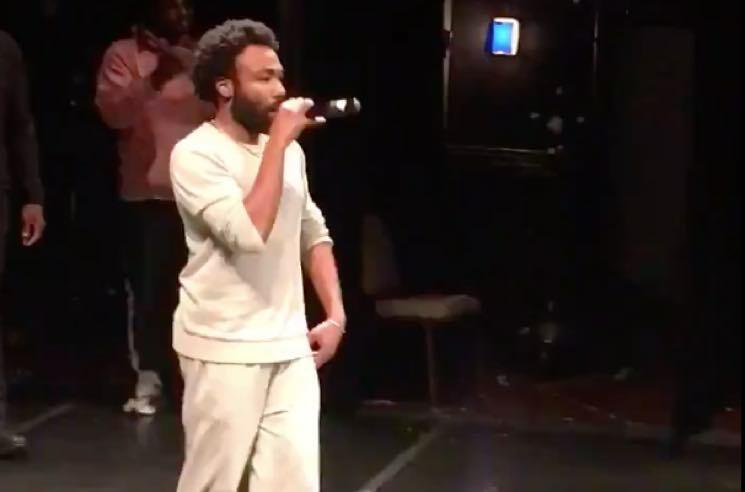 Glover performed his recent politically charged Childish Gambino hit "This Is America" for the crowd of high school students. Dubbed OpenMike, the monthly event provides Chicago with a "safe space for high schools students to share, express, and network with like-minded individuals." Last night's event was hosted at the Pritzker Auditorium at the Harold Washington Library Center — a decidedly smaller venue than Gambino will be playing on his upcoming North American tour. Understandably, the kids in attendance went wild for the surprise appearance. Watch some footage of Glover doing "This Is America" below. Childish Gambino's album Awaken, My Love! is available through Umusic on CD, LP, or VR vinyl box set.